At 5pm Sico rides his rickety $300-worth motorbike, newly repaired at 3pm, from his home in Lecidere, to his place of work, a distance of 300 metres. Sico is a security man who struggles, but fails, to care for his wife and two children on $70 per month. What happens during this 300 metres? A lot. He hears a screeching behind him and half looks round, to see one of those daily Dili disasters – a motorbike accident. He rides on. Not for long. A white patrol truck appears from behind, bedecked with 6 action-hungry cops called “Task Force”. These upholders of the law, dressed in a uniform blue slightly resembling the Portuguese paramilitaries (GNR), set about what they know best, and perhaps learnt in spite of the Police Academy – assault. A crime? Yes, for un-uniformed mortals. But assault it was, without a question, without a warning, a premeditated assault of body and bike. Fresh from shooting dead an innocent citizen in Delta two months before (December 2009), this was the Task Force’s re-entry into law enforcement. With fist and heavy wooden truncheon, they belaboured Sico with two severe blows to the back of the neck and three to the back, all the time holding Sico’s throat in a choking clench. What have I done wrong, gasps Sico? Running from the accident! With that they reign – all 6 of them – truncheon blows and kicks to his rickety bike, smashing the thin plastic wings of the bike in three places, front, middle and back, and topping that with a kick to the newly repaired engine parts, which brought forth an unstoppable flow of fuel. Is this the police’s daily bread and butter? Is this defending a victim, or is this perpetrating a crime against a victim? Does the government pay them to do this? Anyway, by this time the commander of the patrol truck had got out from his front seat and summed up the situation. This man Sico is short. But the man who crashed into the bike was tall. The same colour shirt, yes, but this was the wrong man. Stop your hitting, men! So they left Sico and his bike on the side of the road and hurried off in a belated and no doubt fruitless pursuit of the real crash-and-run man. Apology? no. Help with the wounds? no. Assistance with picking up the bike? no. I came across Sico at 6pm, after finishing work. He was badly shaken and said he had been crying. A man aged 30, a strong man too, who had fought against TNI in his own way during the 1990s. TNI had beaten him severely resulting in chest pains for 10 years and coughing up of blood which has cost him dearly. He must do light work and not exert himself, say the doctors, Cuban and otherwise. More - he must find $30 a month to buy medicine to forestall the possibility of an early death. Sico was shattered, but possessed the desperation to go to the PNTL station and complain. It was now 7pm. Readers would know the futility of such a quest for justice, but don’t we all have to stand true to our disdain for barbarism? What transpired? For the record, no more, the PNTL front man took Sico’s name and noted the motorbike damage, leaking petrol and all. Sorry, he couldn’t help, because he did not know which patrol, out of the many, had done this. Sico pushed further but the front man did not give an inch, warmingly suggesting that Sico went home and attended to his motorbike repairs. The next day Sico got a quote for the repairs, which came to $132, nearly twice Sico’s monthly earnings. He took the quote to the PNTL station, but the front man would not accept the note. The police are not responsible! In the afternoon Sico, still dissatisfied, tried a third time. This time there was another front man. This time the answer was that the patrol was probably from one of the Districts, so, sorry, it was beyond his control. Poor Sico – a poor man, an innocent man, and a man with bruises, swellings and a bill for $132. Who will defend the small man against the Government’s ninjas? Who will pay the $132 for the Government-smashed motorbike? Incidentally all of this defiantly happened just 100 metres from the seaside dwelling of Mr and Mrs Xanana. Do we really need a police force? 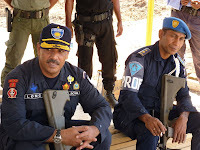 Image added by ETLJB: The Gun-Toting East Timor Police Commander Longinhos Monteiro - Unable -or unwilling - to reign in a violent abusive police force running amok.